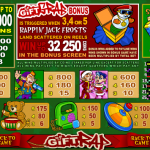 Gift Rap is an older Microgaming slot which has a very unusual theme. The designers decided to use a very popular Christmas theme but gave it an unusual twist. Instead of the traditional Christmas carols they decided to go with rap songs. Santa’s helpers are all into rap showing off their skills on the karaoke machine. The only one missing is Santa himself who doesn’t seem to share their enthusiasm. The symbols in the slot are well designed and have an attractive look, despite the low level animations used. 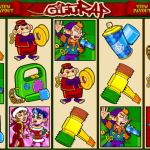 The most attractive part of the slot is the bonus features which can produce some very nice payouts. The wild symbol in Gift Rap is the Wild Bauble. He can land across all reels and will substitute for all of the game symbols except the scatter and the bonus symbols. The scatter can also land on all of the reels, but doesn’t trigger any bonus feature. It only awards a payout of up to 80 x stake if five of them land on the screen. The only classic bonus feature in the slot is triggered with 3, 4 or 5 Rappin’ Jack Frosts on the screen. This is a cash bonus where players can win up to 32.250 coins. You are taken to a separate screen with 30 presents in total. You will need to make picks and each present will award a coin prize. The bonus feature ends when Rappin’ Jack Frost jumps out of the box. Gift Rap is a very interesting slot despite its old age. The game theme is attractive with an interesting twist and the bonus round can be very lucrative. Since the number of presents is big and there are only three Rappin’ Jack Frosts which can end the bonus you can score some really nice payouts. Want something different? how about Eagles Wings a 5 reel classic slot by MicroGaming.